Holidays, especially traditional family holidays, come loaded with many decisions to make. Luckily, flowcharts give us a geeky shortcut to making those decisions. Here are eight that pertain specifically to how you handle Thanksgiving. What are you doing for Thanksgiving this year? It might be a little late to book a flight to Vegas, but that is one of your options for next year. Otherwise, you can go home to Mom and Dad, host your own dinner, or get invited to someone else's home, but once those decisions are made, there are other things to consider. 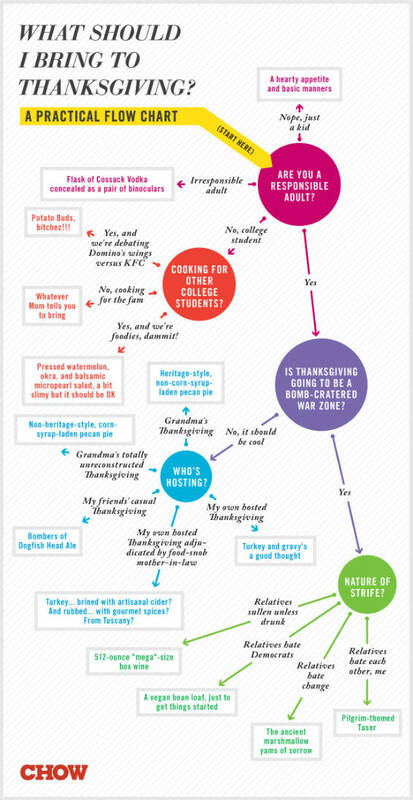 This handy flowchart from The Houston Press can help you make those important decisions about how to spend your holiday. What should you bring to the Thanksgiving feast? This flowchart from Chow breaks it down by your abilities, means, and personality. This one is geared toward younger people, so whatever you bring, no one will be surprised. 3. No Really, What to Bring? If you've dealt with the conundrum of what to take to someone else's feast a few times before, you may have more luck with V.V. 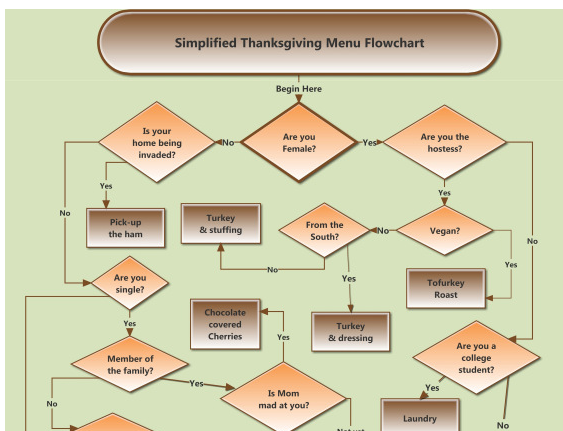 Denman's Thanksgiving Menu Flowchart. It's labeled as "simplified," but it is not simple. Only a portion is shown here, but you can rest assured that if you are a college student going to Mom's house, it's okay to just bring your laundry. 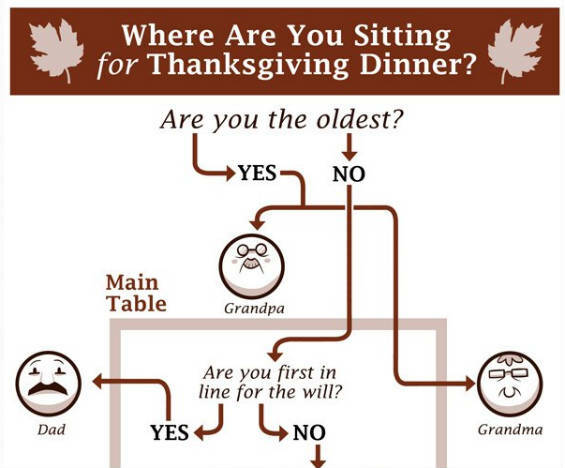 Once you arrive at Grandma's house (or wherever), you'll be told where you are supposed to sit. A flowchart from College Humor will clue you in so there are no surprises. Only the beginning is shown here. Wherever you are assigned, there will be problems, but at least you'll be prepared for them. 5. How Should I Prepare Turkey? Or maybe you're hosting Thanksgiving dinner at your house this year. What to do with the turkey? Should you buy a frozen, organic, free-range, or kosher turkey? Should you marinate or rub it? Should you grill, fry, or roast it? Whew, how do you know which way to go? The answers lie in a flowchart at the New York Times, which will take you through each decision step-by-step. The answers depend on your tastes, your desired result, and what you are willing to do to make your turkey special. 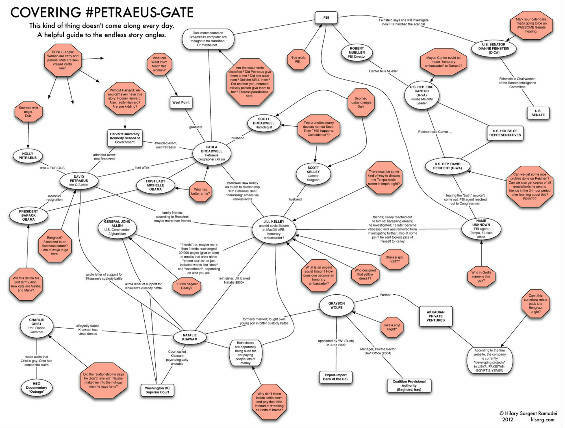 Dinner table talk may turn to current events, including the scandal involving former CIA director David Petraeus. You don't want to be caught totally confused, so you might want to brush up on who's who in the story before you say something dumb. With the brief overview of knowledge contained in a flowchart by Hilary Sargent, you'll know more than most of the people you're eating with. Probably all of them. Yes, it is small and involved, but you can enlarge it here. Let's say you are home from college. You can only take so much family togetherness, so after dinner you are considering changing the pace. 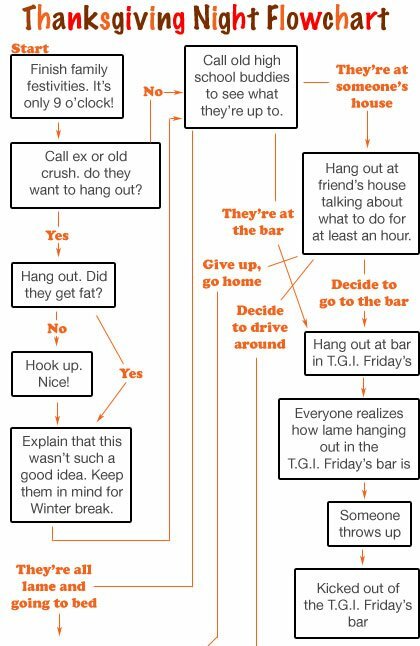 A flowchart from College Humor helps you decide what to do next. Consider carefully. If you decide to go out on the town, you might be confronted with decisions you've never faced before. For example, what if you run into your old high school crush at a bar? You're an adult now, how do you handle it? A flowchart from Ask Men gives you the answers. Follow the logic on the entire chart. There, that was easy, wasn't it? 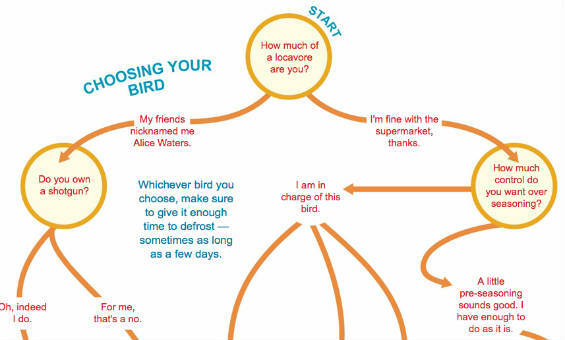 Make the rest of the decisions in your life with the help of other flowcharts we've posted.